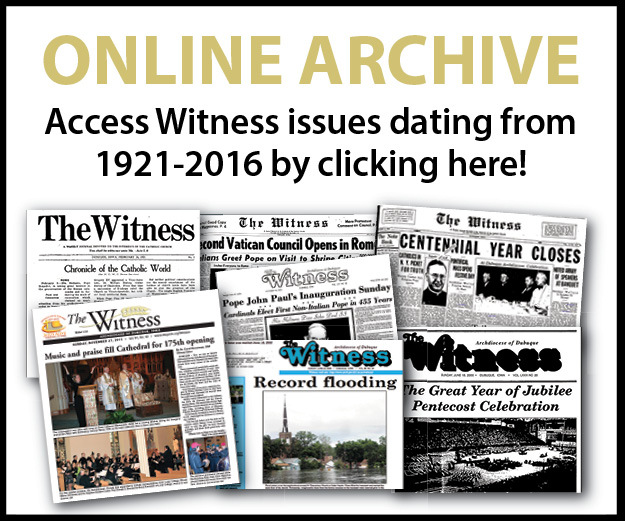 Formerly Janet O’Meara, Sister Anna Mary O’Meara, O.C.S.O., was a professor of religious studies at Clarke University and is the widow of the late Michael J. O’Meara of St. Columbkille Parish, Dubuque. She entered the Trappistines at Mississippi Abbey in March 2011 and made profession of simple vows in August 2013. 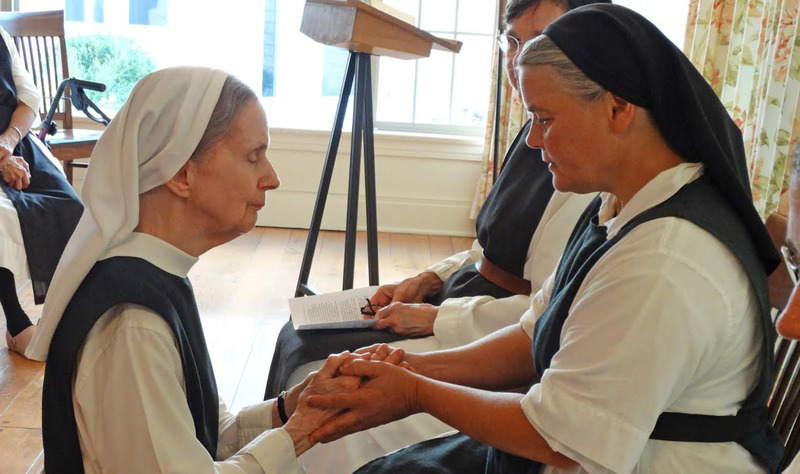 On Aug. 19, the Mississippi Abbey community celebrated Sister Anna Mary’s solemn profession and monastic consecration. 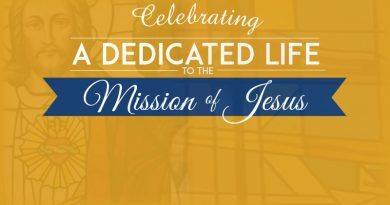 Before the events, Sister Anna Mary reflected on her life as the newest member of the monastic community based near Dubuque. O Lord, this is the time to have mercy (Psalm 101/102: 14). It is 3:45 a.m., all days of the year. 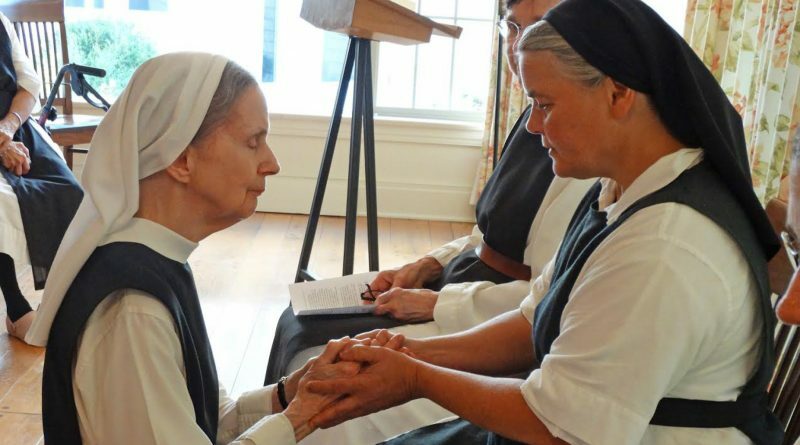 The nuns of Mississippi Abbey are gathered in the monastery church for the Office of Vigils, that hour of the Divine Office that hovers between night and dawn. This is the church at prayer for the world: for all who weep and wait and work through the darkness of night. In this prayer is held the suffering Body of Christ. Personally, as Vigils begins I experience a vivid sense that this is precisely what I am supposed to be doing, why I am here. This awareness of purpose resonates with what I experienced when I first knew the call to monastic life. In the depths of my being Jesus asked me to stay with him and pray, to hold his suffering body in his compassionate mercy. Following Vigils each of us will devote time to Lectio Divina, the prayerful pondering of the Word of God in Scripture, and to a period of personal prayer. I am yet to meet a nun or monk who does not consider these dark, early hours of prayer — quiet with the stillness of the Great Silence — the most treasured of the day. What happens here is what we are about as contemplatives. Truly, these are hours of mercy. In the intimacy of this quiet prayer of the heart we are confronted with the truth of our absolute need for God’s mercy as well as the infinite ways that God’s merciful love, flowing from the pierced heart of Jesus, comes to us through the many nuances of our ordinary days lived in fidelity to the monastic way of life. It is this prayer that gives foundation and sustenance to the whole of our lives given for the sake of Christ’s church. The deepest desire of every contemplative heart is to be united with Christ who emptied himself, becoming obedient to death…to know him and the power of his resurrection and the sharing of his sufferings by being conformed to his death…” (Philippians 2:7-8; 3:10). It is only in, with and through Jesus, our love and life, that we hold in compassion his suffering body. Daily we meet Christ in one another through our life lived in close community. In our interpersonal encounters we grow in self-knowledge and awareness of our need for mercy and forgiveness. The merciful compassion of Christ flows readily between and among us and to the world beyond our cloister. Truly my personal life story is a song of love and mercy. Mine is what is sometimes called a “late vocation” in that I am older than the usual monastic neophyte. My journey here was a long, winding road that included a deeply happy, God-centered marriage to a good, loving and faithful man. 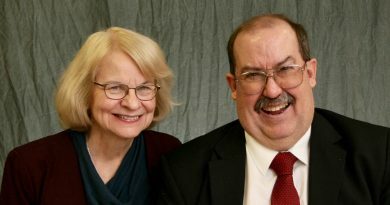 Through the mercy of God I entered the Trappistines eight years after my husband Michael’s sharing in Christ’s suffering and death in which I participated profoundly. In the paradox of this cross I experienced a conversion that redirected my life and gradually yielded a clarity that guided me here. This month we will celebrate my solemn profession and monastic consecration. Is anything too marvelous for the mercy of God to bring forth?